Image of the Week #6: Would You Like Some "Applju"? I'm amused by this ad. It comes on the heels of Prohibition, so in that regard, it seems like it's trying to capitalize on it. I love that the bottle reads "Champagne Type"--whatever that means. The name of the apple juice, "Applju" seems like a strange name. It hints at the exotic, but to actually say it, reminds me of a child asking for his "applju!". Under the label, we see "Pure Apple Juice." This must have been the precursor to the "Natural" descriptor. 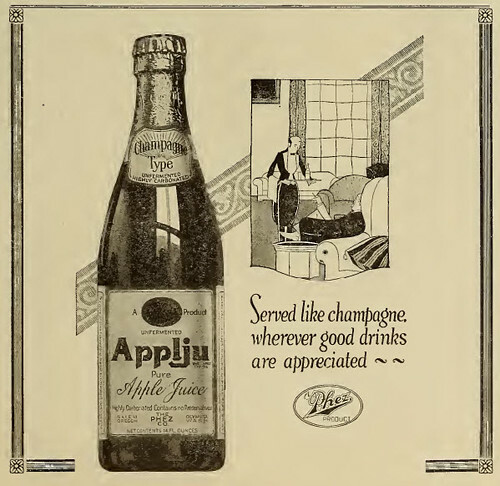 I also am amused by the drawing within the ad of the butler serving a glass of "Applju" to someone relcining in a chair as if to try to make this drink more classier than it actually is.